Use Disney’s Armed Forces Salute Multiple Times! Disney’s Armed Forces Salute is a fantastic money saving offer available to military members and their families. It offers huge theme park ticket and resort room discounts. Because the discounts are so much bigger that the Regular Disney Military Discounts there are quite a few strict rules and restrictions for the Salute offer. The number of theme park tickets is limited to 6 during the offer period and the method in which they may be used is highly controlled. 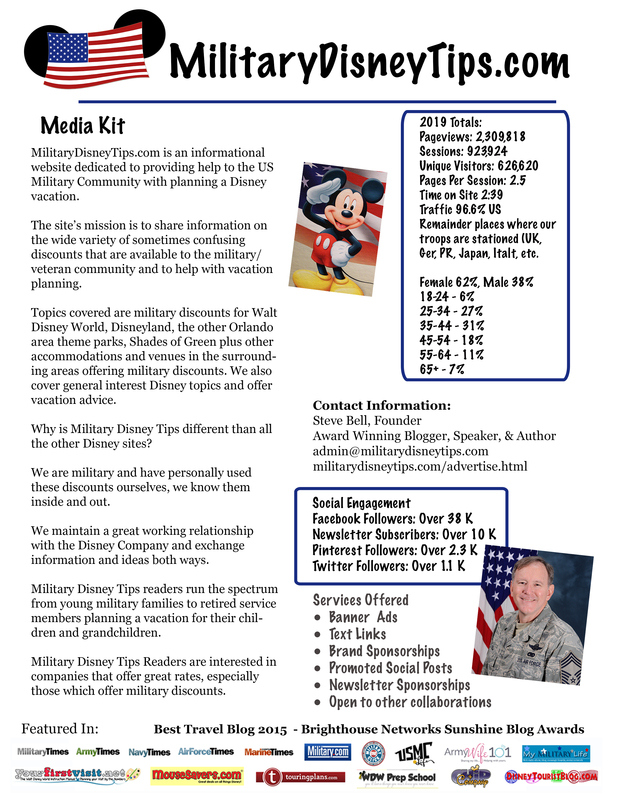 See the Disney Armed Forces Salute FAQ for specifics. It is a little known or advertised fact that the Walt Disney World and Disneyland Armed Forces Salute Ticket Offers are totally separate offers. Every eligible military member may purchase and activate up to 6 theme park tickets at Disney World and also 6 at Disneyland, for a total of 12 tickets during the current offer period! You could go on a spring vacation at Disney World and an early fall one at Disneyland in California. Another great little known fact is that there is absolutely no limit on the number of times you may use the Armed Forces Salute Disney Resort Room Discounts! I always use the room discounts numerous times every year. Need help with your Disney Resort Reservation? 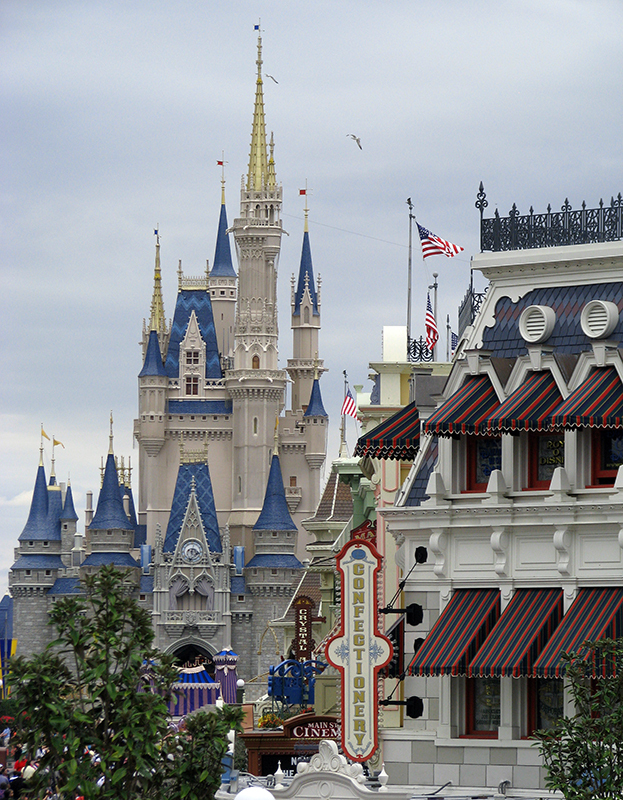 I recommend Ears of Experience, a Disney Only, Military Family Owned and Operated Concierge Travel Agent. If you are stationed nearby or live close enough (or can find cheap flights) using these discounts you could make multiple trips to Disney a year! The combinations of room nights and park days or water park/fun options are almost unlimited. Have you used these discounts more than once a year? Or would you like to? Let us know in the comments below. This year my family and I went to Disneyland (only used 3 tickets) in December and are going to Disneyworld (will only use 2 tickets, maybe 3) in September. If I could get the time away we could actually make another trip to Disneyland and another trip or two to Disneyworld. That would be awesome if you could swing it Michael! My family used the salute with park hopper and fun and more last January and only used 3 theme park days and one day at disneyquest. It was still a great deal but I was sad we had days remaining… no time to use them that trip. Then my husband got an unexpected tdy to mac dill air force base and we spread the remaining 3 fun and more days and park day into another full vacation! I think the fun and more is the best deal with this salute because it’s 8 days of fun …. we had a ton of fun with the water parks that summer but we wouldn’t have tried them without having g those days remaining. Awesome Liz, there are many who swear by the WPF&M!!! My husband and I used our 6 allotted tickets on 3 separate vacations a couple of years ago. I called Disney and 4 different occasions to make sure that it wasn’t against the rules but never did get a straight answer. When we activated the second set of tickets, the cast member told us, “they were not intended to be used in that way.” But when I activated the third set of tickets, the cast member told me that I had until the end of the Salute year to use up the days on each ticket. We enjoyed our 3 Disney trips in 10 months! You’ve stumbled on the frustration of my existence… and reason for my site. Disney call center cast members know almost nothing about Disney military discounts! There seems to be no training or corporate knowledge amongst their mostly part time workers. In their defense, the percentage of questions they get on the topic is small compared to their normal general public work. When they get a question they don’t know the answer to they either do a search of the network for keywords which may turn up a 5 year old document with old policies, or they go off what they remember, think they know, or heard someone else say… All of which leads to incorrect information being passed to the military guest. I’m surprised though about the comment made the second time by the tickets cast member, they are usually on top of things. Please note they do enforce the restriction on 6 total tickets per park (CA or FL) per year. We used five tickets in October, then tried to use two in January – we had to upgrade one to a full price ticket at the gate! Two years ago, we took a VERY large group to Walt Disney World with two soldiers. We had a total of 13 people, though and the thirteenth (who was added at the last minute) was told that she would have to pay the military price instead of the AFS price before we went. When we got to the main gate at the park, the CM at Guest Services told us that if your family is bigger than 6 people (because it happens) they’re usually willing to accommodate you with extra AFS tickets, but you have to get them at the park because SoG won’t do it. Does the Water park and more option also include the 4 disney themed parks? The Water Park Fun and More option is an extra added onto a theme park ticket, in this case the 4-day Disney Armed Forces Salute ticket. So you’d get 4 theme park days, and 4 WPF&M entrances. If I am a family of three can I purchase all 6 of the AFS tickets and use it for all 3 of us to total 8 non consecutive days? Yes you sure can Charity. We had a great family trip with Grandpa (our military connection) to Disneyland in CA in June 2015. We used all of our alloted 6 salute tickets. Then shortly after that, you announced that they were extending this years salute through 12/20 and increasing the number of tickets available. We are now going to WDW in November, and taking Grandpa again (what a good sport!) and some friends. Do we have 6 available salute tickets or 12 for our upcominmg WDW trip? Thanks for you help and expertise! I really enjoy your website and blog! Thanks for all your info on this site it is amazing! I am confused by this comment- can you get 12 salute passes at WDW and not DL? This comment and reply was during the 2015 Disney Armed Forces Salute extension (Oct-Dec 2015) when an additional 6 tickets were added to the limit for both WDW and DLR. This was due to that particular offer being extended past 12 months and the fact that there might have been those who had already used up their allotted 6 during the original offer (Oct 2014-Oct 2015) yet wanted to go during the extension period. Are these discounts available to disabled veterans? My family and I are going to WDW. My husband bought 6 salute tickets and a month after a nephew decided to go with us. My husband bought a 7th ticket. Am I In trouble for doing that? What can I do about it? Unless there is a second military member or spouse of a second member in your party who still has eligibility, you will not be allowed to activate that 7th ticket. Or you could take the ticket to Disney and when activating the 6 he is eligible for ask Disney to let you use the 7th Salute ticket towards a full price ticket. They have done this in the past, but you may also have to escalate to management for this option too. Explain you were sold the ticket when you should not have been. For the 2017 tickets. Are they like other Disney tickets that have to be used in 14 days of purchase, or could we buy the 5 day tickets for a trip in March 2017 and go 3 days and then use the other 2 days later in the year? It is the latter Regina, the Disney Armed Forces Salute tickets do not expire until the end of the offer. Thanks you so much! So glad you checked and that I was able to help. We got 2 of the four day salute and on the first day, my husband was so ill with fever he had to leave a few hours later. so he didn’t use his assigned fast passes. I continued on and used the fast passes for my ticket on the first day.. Since we already had fast passes lined up for the other three days which we did not return to park and headed home. So I didn’t know how to cancel these fast passes for us. Does that mean we can’t have fast passes when we try to vacation later in the year with our Salute tickets? This is tough as if we go with others, can we have fast passes for the remaining 3 days that we didn’t enter the parks? I hope I made this clear. Since you didn’t use your tickets on those three days the FastPasses should not matter (should have dropped off). But you can check right now by logging into your account and seeing if the next 30 days is open for you to make any FastPasses. If it is you are all set. If not just call the tech support number above in the post and they can help you. Thank you, you are right again! Steve, Remember we bought 2 of the 4 day tickets, but could only use one day so we went back down in Dec of the same year. When we went down again we wanted to make it a 4 day park trip where we would buy an extra day to make it in all a 5 day trip for 2017. We could not buy the extension at Shades as we didn’t buy it directly from them. So when we went to park we added the day to our MB’s. Long story short it was a benefit to order tickets thru Shades..
Yep, Shades will only upgrade tickets that they originally sold. But Disney will gladly do it as you found out. Glad it all went well! We have just ordered our 6 tickets and are waiting to receive the vouchers. We plan to use 2 of the tickets in April and the remaining fro for another trip in September. Do we have to activate all 6 tickets at one time when we go I. April or can we activate 2 in April and then wait to activate the other 4 when we go in September? You can activate them as needed, so in April and then in September. I love your website and have found it so helpful on our recent trips to WDW and DL! So far we have used 4 salute tickets to DL this year and might be taking two additional guest with us on a trip to DL later this yr. Are we able to buy 2 more DL Military Salute tickets for them under the service members 6 DL Salute ticket allotment this year even though the service member currently has 3 more days on a 4 day parkhopper? Also are the still 6 salute tickets available in 2018 at WDW? Just wanted to confirm in case we decide to book a vacation to WDW instead of visiting DL again. Yes, as long as the member (or spouse) has an active Disney Armed Forces Salute ticket with days left, they may buy/activate more tickets for others up to the 6 ticket Limit at DLR. And the WDW and DLR offers are actually totally separate, so you still have 6 in FL! If a military family member purchases four tickets for the family and also activates the tickets with the family present, does the military member also need a ticket and have to attend the park with the family? I contacted guest services and was informed that he only has to activate the tickets but I have been reading otherwise. Are we talking WDW or DLR? At WDW the member needs to have a ticket (unless they are a pass holder) and activate it. they do not need to stay with or enter with their guests. At DLR the member needs to have a ticket (unless they are a pass holder). In California there is an Military ID check the first time you enter a park, so you’d have to go to the turnstile and ask them to let them in without you. You might say you are going to the other park… You do not have to stay with your guests there either. Quite a few years ago (4 or 5) at DLR they did require the member to enter each time with their guests. Good morning, We bought 6 tickets and went in July to DLR and purchased another 6 tickets becuase we planned to go in December, Where we bought the tickets they said the sales are final, I was under the impression that it was 6 tickets per family at a time but some say that is 6 tickets a year period. But why would they sell us the tickets? Will Disneyland let us use the tickets since we already purchase them? and do they have our SSN number that they will know how many tickets we purchased? I’m sorry they allowed you to buy 6 more tickets. It’s because most Base ticket Offices do not know what they are doing. I constantly hear horror stories like yours. The limit is 6 Disney Armed Forces Salute Tickets per military member during the 2018 Disney Armed Forces Salute offer. Did they even ask you if and how many you’d purchased so far this year? My Ticket Office just asked me that last week when I purchased 2 tickets. When you activated the 6 tickets in July with your mil ID/CAC Disney recorded identifying info. You will not be able to use the tickets they sold you. 2. Take the tickets with you to Disney. Explain what happened and see what they will do. They should at least let you use the value towards full price tickets. There is even a very slight possibility that they will spread some pixie dust and let you use them. I’d appreciate your touching base after whatever happens to provide intel!!! Would you mind sharing what Ticket Office put you in this position? I have a question on this. So is there a way to split the days or is this just meaning if u only use four of the tickets u still have two left to use. If I were thinking of going on a Disney Cruise and wanted to do one day before we left then finish with the four when we get back with a 5 day ticket that’s not possible correct. It has to be used consecutively?? Thanks for any info would greatly be appreciated!! Yes Michelle absolutely. You do not need to use the Disney Armed Forces Salute tickets consecutively. All days are valid through the end of the offer. Well, I think we messed up. My son-in-law bought 10 salute passes for our trip next month. He even called Disney to see if it was OK and they said it was fine! Now I am worried that we will get there and not be able to activate them and not get our money back. Everyone that is going is a family member, but it includes grandparents, siblings, etc. We tried to do the right thing, but I don’t think we did. Any suggestions? It seems like you are in a predicament. Let’s first ensure he did buy 10 Salute tickets, the prices would have been the below ones or within a few dollars (not hundreds different). And that he got 10 at that price and not a mix of 6 Salute Tickets and 4 of the non-Salute Regular Military Discounted Magic Your Way Tickets (these are the much more expensive ones). If you have more than 6 Salute tickets and only one military member, you will not be able to use the other 4! Sadly the people who man Disney’s phones know almost nothing about their company’s military discounts. Did he buy them all at once from one Base Ticket Office? Would you mind sharing what one it was that messed up and did this? 1. If he bought them all at once he needs to take 4 back to the offending ticket office and demand they exchange them for the Regular Military Discounted Magic Your Way Tickets for the children (they are cheaper). He will have to pay the price difference. And he will have a fight on his hands as the Salute tickets are non-refundable. But the ticket office messed up selling him that many. He must escalate to management or Base Military supervision of the Ticket Office if needed. This would be the ideal situation as you can then link tickets for all 10 and make FastPasses. 2. Bring the ones you can’t use to Disney and ask Disney to let you use them towards full price tickets. Doing this you’ll have to make your FastPasses for the 6 ahead and then after getting the 4 new tickets upon arrival go to Guest Relations and explain the situation then ask them to match the 4 new tickets’ FastPasses to the existing 6 tickets’ FastPasses. Hi Steve, Thank you for your input. What we (mis)understood was that we thought that he and my daughter could each get 6 salute tickets. Clearly we were mistaken. We had to buy the tickets at two bases because there were not enough at one base, so it is not their fault. We thought it could be a problem, thus the call to Disney World, and figured if he was not allowed to do it, they would not let him buy them. Sigh. We will try to get a refund… sounds improbable… and if not try and get Disney to apply $$ to full price passes. We are VERY thankful for the discount and hope that we can get this sorted out. The limit tracking is done by Disney during the activation process, not at the bases. The second base would have no way to know he’d bought elsewhere, though both bases should have briefed him on the rules. My base does and then makes you sign a paper stating you understand the rules. So if he can’t get a refund, go ahead and set 4 tickets aside with the receipt. Then go ahead and link the 6 you can use in My Disney Experience (to adults) and make your FastPasses for those 6 when appropriate. Then when you arrive go to activate those 6 at a Guest Relations window not a Ticket one. Explain the situation and ask if you can use the 4 anyway (sometimes magic happens) if not ask to use their value towards full price tickets (hopefully you have 4 kids 3-9 in the party as their tickets are cheaper). Then once you’ve activated the tickets you’ll need to be at a guest relations window to fix your FastPasses (that’s why I suggest going to a GR window in the first place). The person there will know the situation already. Tell them you need the new tickets to match the FastPasses you’ve already made for the first 6. Some they will be able to do on their own, others they may need to elevate to have them fixed but it can be done. In some cases the other 4 will have identical FastPasses for the ride and time, in others they will be issued a carte blanche FastPass good for one entry all day at any ride in that park (depends on if FastPasses were used up for that ride/time). This is all going to take quite a while (especially the fastPasses, I’ve been on the phone a hour fixing FastPasses that got deleted on a vilid ticket), so I suggest doing this on your arrival day/evening versus when you are trying to get to the park that first park morning.